In Day 2 of this Beginners Guide to Paris, you will start in the Marais with a croissant beurre in hand as you walk through one of Paris' oldest markets. Get your shopping fix in before enjoying a world famous fallafel al fresco. Cross over onto the islands of Paris as you take in all the historical sights including Notre Dame before you make your way over to Rive Gauche, the Left Bank. From here you will take a stroll through France's main botanical garden, sip on mint tea at the Great Mosque, and walk one of Paris' biggest market streets as you make your way to The Pantheon. Go back in time when you sit on the church steps from Midnight in Paris, take an apero at a neighborhood jaunt at Les Pipos, and enjoy the streets of Paris at night walking through Saint Germain before feasting on delicious steak frites at Le Relais de l'Entrecote. After indulging in some desserts, end this jam packed day with a drink among some of our literary celebrities in history at Les Deux Magots. C'est tout mes amis! You’ve had a pretty historical day. So let’s cap it off with one last stop, a drink at either one of the famous cafes, Les Deux Magots or Cafe de Floré, the choice is yours. Whether or not you are a Hemingway fan, sitting at either of these restaurants is like stepping back into time. Sit back and listen to the sounds of Paris at night, watch the city go by, and get ready for another day. Aaaand with that I bid you, farewell and goodnight. I’m sure you have worked up quite the appetite today. It’s a good thing steak frites is on the menu tonight. In fact, it’s the only thing on the menu. You may have to wait in line but don’t let that hangry side out just yet, it moves pretty fast as this place is a steak frites institution. You’ll immediately be served the best salad of your life (unless you aren’t a fan of dijon mustard. Apologies to all of you!) and of course a basket of bread. The only questions the server will ask you are how you would like your meat prepared and what drinks you'd like (sometimes you'll get a drink menu but more often than not, it's a simple vin rouge or vin blanc). I don’t know how they do it, but that green goddess sauce with the steak and fries is a picture perfect dinner in Paris. And definitely save room for dessert because you have to order two, the Vacherin du Relais and the Profiteroles! Yay food! It’s definitely 5 o’clock somewhere. Grab a table outside and enjoy a glass of rosé (or any beverage) in one of Paris' oldest neighborhoods. If you need a snack before dinner order the saucisson sec and make sure they give you the house pickles! I know, it’s been a big day for sight seeing, but this is the last one and it’s basically right in front of you! Plus, I promise a cold beverage is right around the corner. If there are any Midnight in Paris fans out there, walk over to Saint Etienne du Mont and you may recognize something. Yep! These are the famous steps where Gil (Owen Wilson) is sitting when the clock strikes midnight and he goes back into time! If you could follow in his footsteps, what era would you travel back to? Continue up until you find yourself on top of Montagne Sainte-Geneviève, the historic hill of the Latin Quarter, where you will find The Pantheon towering high above. Modeled after the Pantheon in Rome, this neo-classic building is a present day mausoleum for prominent French men such as Voltaire, Rousseau, Alexander Dumas, and Victor Hugo. Tickets can be purchased to visit the crypt and to climb the 206 steps to the viewing platform in the newly renovated dome (for an extra 2euros). If you don’t climb the dome, you can still get a great shot of the Eiffel Tower. If you are facing the columns at Place du Pantheon, turn around 180° near the center of the square and voila! Now that you’ve rested your tired feet for a bit, start making the climb up Rue Mouffetard, one of Paris’ main market streets. If you want to visit during peak market hours, make sure to plan a visit for Saturday or Sunday mornings when it feels like all of Paris is shopping on Rue Mouffetard. Even if the markets aren't open, there is plenty to indulge in here including one of Paris' oldest fromageries, The House of Androuet. 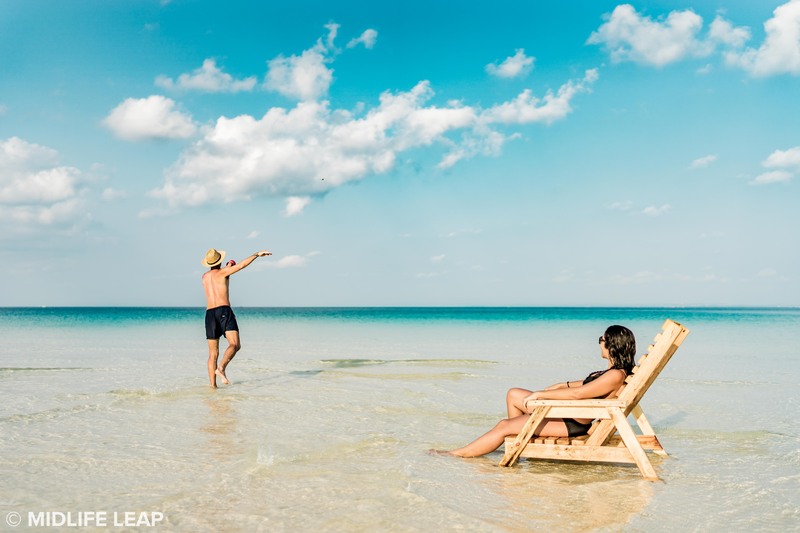 Go on, don't be shy...you're on vacation! I know, you need a break, so let's take an awesome one. Step out of Paris and into what feels like far away lands for a cup of delicious mint tea at the Great Mosque of Paris. Grab any open seat and wait for one of the waiters to come by with a tray full of this much needed tea break. There is a little counter inside selling tasty treats if you need a snack. And If you are up for it, you can take a tour of this breathtaking landmark. But first, tea. Okay you’re in Paris, so I guess you should see some sights too? If you haven’t already, walk through Place des Vosges (pst. No. 6 was Victor Hugo’s old pad, you know from Les Mis and The Hunchback of Notre Dame), take a fun picture at Hotel Sully, cross over Pont Marie for a scoop (or 2) of Paris’ famous Berthillon ice cream. Now head over Pont Saint-Louis (which links the two islands) for your up close look at Notre Dame which is free to enter. But, if you plan on climbing the 387 stairs to the towers, you will need to purchase a ticket for €8.50 or €6.00 for a visit to the crypt. While you are visiting Notre Dame, take a peak at Point Zero, the absolute center point of the city from where everything is measured). Here on Île de la Cité, you also have Saint Chapelle. Built to house precious Christian relics including the Crown of Thorns (currently housed in the cathedral treasury of Notre Dame), today people line up around the corner to peak inside this 13th century gothic church as it has the world's largest collection of original stained glass windows. Next is the Conciergerie, a medieval royal palace turned into a revolutionary tribunal which was used to house high value prisoners such as Marie Antoinette. If you want a nice picture, walk down Pont au Change and turn back around to capture The Conciergerie. Walk across Pont Saint-Michel to start exploring Rive Gauche, Paris’ Left Bank. Pst. There are many ways you can get to Jardin des Plantes, your next stop on your Day. But, if you'd like a suggestion, we love walking along the Seine through Jardin Tino Rossi, an open air museum that ends up right in the garden! If you have talked to anyone who has visited Paris or googled, “best places to eat in Paris,” chances are you have come across L’As du Fallafel. But just because it seems popular or “too touristy” don’t let this keep you from experiencing one of the best falafels of your life. Really, it’s that good. In the heart of the Jewish district, once you notice the sea of passersby holding bright yellow napkins, you’ll know you’ve come to the right place. Don’t be surprised when you see a constant line of people spilling out onto the cobble stones of Rue Rosiers. There are two lines, one for dining in and one for take away. Our suggestion is to wait in the take away line (I promise it moves fast), get your falafel (and say 'yes' when they ask you if you want the spicy sauce) and head over to Jardin des Rosiers-Joseph Migneret or if you can make it, Place des Vosges for the perfect lunch experience. Bon App! Pst. If falafels really aren't your thing, head over to Breizh Cafe for a famous Breton style crêpe in the Marais. And if you're up for it, pair it with a refreshing cider! Is it possible to come to Paris without indulging in a little bit of shopping? Mais, non! C'est pas possible! The Marais has definitely developed into one of the trendiest neighborhoods in Paris which anyone can see based on the number of boutiques on every street and around each corner. 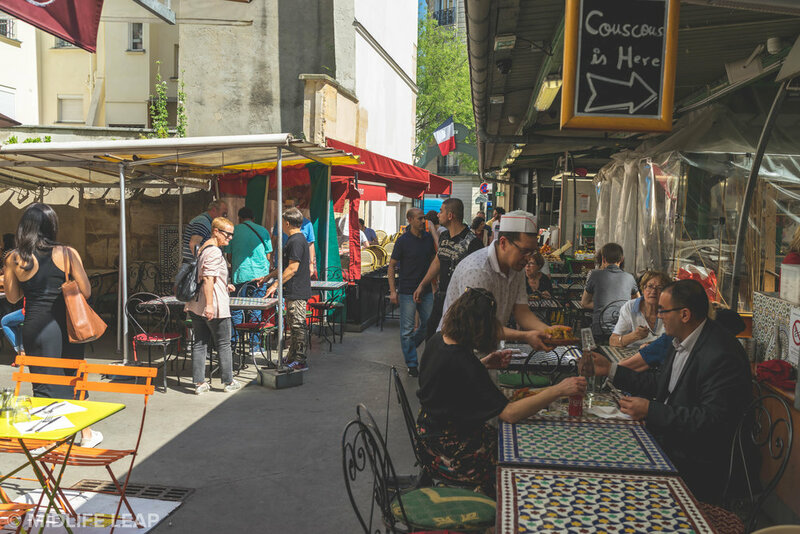 A few favorites that can’t be missed include, Rue des Francs Bourgeois, Rue Vieille du Temple, and Rue des Rosiers, but don’t worry if you don't hit every "popular" street, there are more than enough stores and hidden gems throughout the old Jewish quarter. Wherever you end up, I'm sure you will have a smile on your face (your wallet, however, may not feel the same) 😃. (PS. If you find yourself craving something sweet (or want something for later), don't miss out on Pierre Hermé in the Marais for some of the best (and most expensive I should add) macarons in the city). Taking the title as the oldest covered market (over 400 years old!) in Paris, Marché des Enfants Rouges gets it’s name from it’s previous resident, an orphanage where the children were dressed in red, the color of the Christian charity during that time. Today, this is a diner's (and food shoppers) paradise. Weekday lunch and weekend brunch can be extremely hectic at the market, so take this chance to stroll around before the hungry crowds roll through. You can find everything from, “Paris’ best sandwich” to Moroccan couscous; to freshly picked flowers and sensational french cheese. Feel free to nibble here and there, and pick up some snacks for later, but don't get too full because lunch is on the way. I would say it’s pretty much mandatory to start off any day in Paris with a buttery, flakey, croissant and what better place than the 2014 winner for this delicious pastry? Tout Autour du Pain screams Paris before you even walk through the doors. The price tag may be a bit higher here but when we are talking layers of some of the best quality butter (which you can taste in every bite), it’s worth the “splurge.” Go ahead and get your insta post as you continue down Rue de Turenne, it’s a great shopping street too! PS. If you are visiting over the weekend, Tout Autour du Pain is closed. If you are staying in the lower Marais, an alternative is Au Petit Versailles du Marais which is open on Saturdays and has a lovely terrace to enjoy a café and croissant. In Day 2 of this Beginners Guide to Paris, you will start in the Marais with a croissant beurre in hand as you walk through one of Paris' oldest markets. Get your shopping fix in before enjoying a world famous fallafel al fresco. Cross over onto the islands of Paris as you take in all the historical sights including Notre Dame before you make your way over to Rive Gauche, the Left Bank. From here you will take a stroll through France's main botanical garden, sip on mint tea at the Great Mosque, walk one of Paris' biggest market streets as you make your way to The Pantheon. Go back into time when you sit on the steps from Midnight in Paris, take an apero at a neighborhood jaunt and take an evening stroll through Saint Germain before feasting on delicious steak frites. After indulging in some desserts, end this jam packed day with a drink among some of our literary celebrities in history. C'est tout mes amis!